night. But wait; —- there was a problem that may have been overlooked by many. Specifically, the splendid voices of Mr. DeMott, Cody Shawn Gay, and Janien Valentine were to be so viciously over-amplified during the evening that at many points in the program audio distortion was the modus operandi. What on earth were the sound engineers thinking? With free mezzanine and lawn seating (sponsored by Woodforest National Bank and KPMG, LLP), and additional sponsorships from Houston Family Magazine and CultureMap, this over-amplification was an especially sad circumstance as the large audience included many who had probably never before enjoyed performances at the Houston Grand Opera or “The Met” in New York, where back in the 1960’s I first had the thrill of hearing world-class singers right on the stage in front of me. In this age of routinely blaring rock concerts, it is pathetic to think of the many Pavilion audience members who missed this opportunity to hear what pure vocal excellence could really sound like. In my opinion, these three artists could have stepped away from microphones during some of the selections and been heard quite well at the top of the lawn. On a happier note, sound levels for the superb orchestra itself were very well managed, and one would expect no less under the fine musical direction of jocular Michael Krajewski, looking summer-crisp and cool in his white shirt. With just soft rainbow lighting as a stage backdrop the orchestra began with the immediate and pulsing thrills of R. Wendel’s arrangement, “Balli il Tarantella.” It was merry and joyful with playful accents from brass, woodwinds, and percussion, all neatly wrapped in the sound of the rich and mellow strings. authoritative power and focused intensity, DeMott stepped forward next for a thrilling, “Salute to the Italian Tenor,” that featured many numbers associated with the late, great, Luciano Pavarotti. For the final set the formally dressed trio found Miss Valentine attired in a glittering burgundy dress overlaid with sequined lace as the three began with a medley titled, “Singing Italian Songs,” that featured some lightweight choreography that was neither memorable nor offensive. The next medley featured popular Jersey Boys selections like the hand-clapper, “Oh, What a Night,” but there was perhaps a bit too much in the way of cutesy (and probably exhausting) stage antics from the three principals. There was even a bit of jitterbugging from the energetic cast during Louis Prima’s fun-filled, “Jump Jive Boogie Woogie.” Then it was clearly “Time to Say Good-bye,” with the serene encore of “Con te partirò,” familiar to many from the world-wide hit performed by Andrea Bocelli & Sarah Brightman. 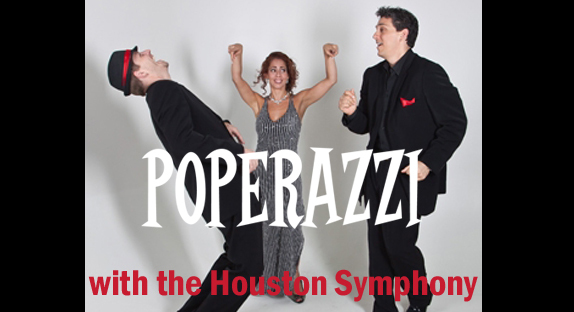 The Houston Symphony will close its summer season at the Cynthia Woods Mitchell Pavilion with a performance of “Brahm’s Violin Concerto” on Thursday September 15, 2011 at 8 pm. Mezzanine and lawn seating will again be complimentary. For tickets call 800-745-3000 or visit any Ticketmaster outlet. This entry was posted in Broadway, Concert Reviews, Miscellaneous Reviews and tagged Broadway, Celebrities, classical, concerts, Entertainment, Houston, music, Reviews, Texas. Bookmark the permalink.